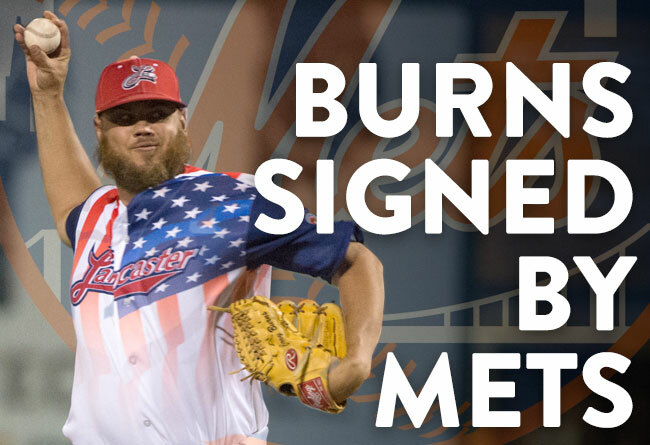 (Lancaster, Pa., Dec. 20, 2016) - Lancaster Barnstormers relief ace Cory Burns has signed a 2017 contract with the New York Mets organization. Burns, 29, appeared in 55 games for the Lancaster Barnstormers in 2016, saving 31 games, the second highest single season total in franchise history, with a 2.17 ERA. The right-hander from Arizona converted all but three save opportunities during the 2016 season and was perfect in save chances at home at Clipper Magazine Stadium. In 54 innings, the former San Diego Padre and Texas Ranger yielded only 50 hits and eight walks while striking out 60. He gave up two home runs, both on the road. For his efforts, Burns was named the 2016 Player of the Year by Barnstormers fans. Prior to coming to Lancaster, Burns had appeared in 27 big league games with San Diego and Texas in the 2012 and 2013 seasons, going 1-1 with a 4.60 ERA. During his minor league tenure with the Cleveland Indians organization, he saved 88 games in his first 2 ½ years, leading the Carolina League with 30 in 2010 and the Eastern League with 35 in 2011. Burns is the second member of the 2016 squad that ended the season in Lancaster to be signed by a Major League organization this week. Earlier in the week, the Chicago White Sox announced the signing of outfielder Caleb Gindl. Previously, the White Sox had inked first baseman K.C. Hobson to a 2017 minor league contract.